I opened the entrance door wide – the alarm instantly stopped. So this morning, the usual morning agony of extreme overwhelm started – and this time, I immediately knew: this is NOT a threat, it is an opportunity to remember Who I am. I relaxed and allowed it. knowing fully that I can TRUST GOD now. The chaotic energy from the collective human mind poured in – and when it was met with curiosity and wonder, it transformed. I yawn just by writing it down. I AM WILLING TO TRUST NOW – and I will celebrate it! YESSS!! HOORAYY! I DID IT!!! This is so vitally important to remember: each time I now become aware that something has changed in my mind, I will celebrate it, give thanks for it, write it down, make it MATTER – truly make it essential and wonderful in my life. I see that old mind that I have fed with fear, for aeons ( the word-correcting-program suggested “canons”🙂 ) is like a child – and that I am in charge. I am the elder, the Observer, I am connected to my Source, and in this state of no resistance and fear, I act. And when I forget, hey, there I go again. breathe now, breathe deeply, connect with Mother Earth, connect with the Core. The mind instantly tell that it does not know how – and I tell it again: you don’t have to, child. I am the Elder, I am in charge. I wrote a poem the day before yesterday – it came automatically. It aforesaid what I have realized fully this morning. Still, I have trotted along – most frequently remembering to trust the process. The – shall I call it “madness”? returned with full power this morning. I sat down with it, asked for help, and suddenly the voices of Love were all there was. “You know what this is: it is the old Leelah-child-identity. What hurts so much is your belief that you you ARE it – still. And the only way for you to give up this belief is for you to allow her to express whatever she wants – in your voice, out loud:) and just listen. Repeat back when needed. The more you experience that you ARE the big heart that holds is all, it will be impossible for the old energy-identity to claim that it is you. Your one and only problem is your belief that you think you ARE this agony when you feel this agony. You know this too – right? And each time you wake up – or lay sleepless the whole night – with these agony fields – is a shining possibility to turn TO it and thus claim your divine identity as Christ. I went downstairs and opened my journal. This sketch lay on the page I opened. It is just a blob of colors on a paper-palette – and I noticed that I had made a figure and a story of out that blog years ago. 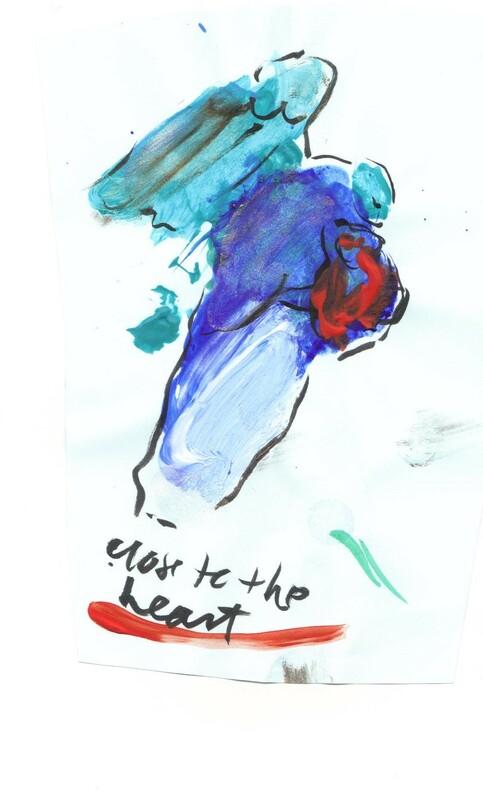 Here is “The Loving Heart” – or angel – holding the red bleeding wound/child/ close to the one Heart that we all share. And more than anything, this is a God-sent sign that I CAN – and CHOOSE to – trust the process. When pain and depression comes, my job is to turn toward it and love it: knowing I AM that LOVE. Oh the beauty of surrendering old thought systems! Last night a saw that Peter had sent me a friend request, and all the old gloom and doom-energy raised its ugly head. Oh that feels SO bad!So I sat with the energy of it, and in bed I asked for correction of my perception again and saw my Self embracing him, right where he thought himself to be. Today he has disappeared off the Forum/website completely. That is exactly what we are told will happen when we change our response to the people who we find difficult: either they start to move towards love and share our thinking – or they disappear off the chart. I sat in the sofa with God, telling him I am here to be helpful. The doorbell rang, the sweetest young girl with a beautiful loving smile asked me to by a Sundaypaper. I don’t like that paper, so I thanked no. Then I realized: by calling her back and telling her I loved her smile i WOULD be truly helpful – in ways I have no idea about. So I did that, and she smiled even broader, and her way of moving was lighter. There was also a strange and surrealistic thing happening last night: when the old disaster thoughts with their accompanying energies came, I got the idea that I did not want to do what I always have done: figuring out what to do that is the right thing to do – going from wrong-mindedness to rightmindedness. That still implies some thinking and figuring out for me. So, all of a sudden, I just started to imagine the most surrealistic ways to see the surrendering of fear. I don’t remember the details, but I started to giggle and felt a great release just being willing to think in a different way. And what a different way: playful,surreal, NOT SERIOUS.